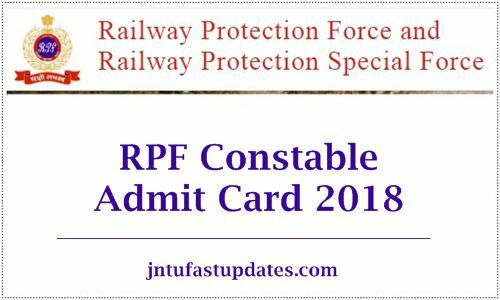 RPF Constable Admit Card 2018: Railway Protection Force has recently announced Constable (Sipayi) vacancies and accepted applications from the interested and eligible aspirants. The RPF is going to shortlist the candidates based on written test and Interview rounds. The Railway Protection Force has scheduled the Constable written test from 02nd February to 19th February 2019. All the hopefuls applied for RPF Constable Posts must get ready to attend the examination. Candidates have to download RPF Constable admit card previously to attend the examination. Hall ticket/admit card is the most important document to attend the test. Hence all the applicants can get their hall tickets from the RPF official website, indianrailways.gov.in/constable2.rpfonlinereg.org from 25th January onwards. Candidates applied for the RPF Sipayi posts will get the roll number initiation on 16th November. Hence the applicants can initially check their roll number and download the admit cards from the availability date. Railway Protection Force (RPF) is the central government organization that recruits the suitable candidates into various posts. The RPF has recently announced 8619 constables (sipayi) posts. Lakhs of competitors have applied for the RPF Constable posts during the application dates. The organization received a large number of applications from across India. The competitors applied for Railway Police Protection Constable Posts will have to qualify various rounds Computer Based Test (CBT), Physical Test (PET & PMT), and Document Verification (DV) rounds. The selection process will be curtailed this time as the competition is higher for RPF Constable Jobs. Candidates applied for the RPF Police Constable vacancies have to attend the screening test in the month of December as per the scheduled dates. Candidates those have applied for Constable posts can Download RPF Constable admit card 2018 from 25th January onwards to appear for the examination. On the homepage, click on RPF Constable Admit Card 2018. Take a printout and save it at a safe place to carry to the examination.